If you want to read memoirs by famous organic chemists that describe the pleasures and pains of doing real science, you can do no better than reach for historian Jeff Seeman's marvelous and unique set of edited autobiographies published in the 1990s by the ACS, titled "Pathways, Profiles and Dreams". These include volumes penned by such bigwigs as Jack Roberts, Derek Barton, Ernest Eliel, William Johnson, Carl Djerassi and Vladimir Prelog. All of them are eminently informative, inspiring and readable and chart out half a century of organic chemistry during its golden age. Even among these volumes Michael Dewar's memoirs stand out. Dewar was a truly brilliant man with a vast and in-depth knowledge of not just many fields of chemistry but of other branches of human knowledge. He had an illustrious career starting out at Winchester and Oxford and ending at the University of Texas at Austin. A man who was equally at home with dense mathematical calculations and the intricacies of organic synthesis, Dewar contributed many ideas to chemistry but two in particular demonstrate the breadth of his abilities. Firstly, when he was still doing synthesis, he was the first to propose the existence of an aromatic tropone ring in the structure of colchicine, opening the door to the world of non-benzenoid aromatic hydrocarbons. Secondly, he was the father of semi-empirical molecular orbital theory which he described in a remarkable set of back-to-back, highly mathematical papers in JACS and then in a book. His autobiography (aptly titled "A Semiempirical Life") is the thickest of the lot and provides him with an opportunity to hold forth on a variety of topics, from vitamin C to the expansion of the universe. Unfortunately Dewar's undoubtedly substantial scientific reputation was somewhat blemished by his pugnacious personality and stubbornness, qualities that enraged his enemies and delighted his friends (and he was nothing if not a fiercely loyal friend). Dewar was quick to engage in argument and generally would not give up until he convinced his opponents of his views. 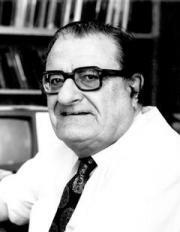 In addition he was rather willing to take credit for ideas that were ascribed to others and enthusiastic to insert himself in controversies; for instance he claims to be the only scientist who changed his views (wrongly, as it later turned out) in the infamous non-classical ion debate largely waged by Herbert Brown and Saul Winstein. A past advisor of mine once had lunch with Dewar, and about the only thing he remembers is Dewar railing against the Nobel committee for not awarding him a prize. All this led Jack Roberts to label Dewar the "Peck's Bad Boy of Chemistry". But Dewar's undoubtedly valuable and prolific contributions to chemistry cannot be denied, and the book contains much of value. Here I want to focus on a section where Dewar describes his take on the philosophy of chemistry and of science in general. In this he was greatly inspired by the now largely forgotten British philosopher Robin Collingwood; in fact he says that Collingwood's works were the single-most important influence on his intellectual development. The reason Collingwood's work is important for chemistry is because of its special relevance to chemical reasoning. This separates it from the traditional philosophy of science that was largely developed by physicists and applied to physics. A model is a simple mechanism that simulates the behavior of a more complex one. A scientific model must simulate the behavior of the universe, or some part of it, while remaining simple enough for us to understand. The test of such a model is purely operational. Does it in fact simulate the behavior of the system being modeled? If not, we have to modify it or replace it with a better one, better in the sense that it simulates the parent system more effectively. There is of course no question of a model being true or false. The same rule applies to scientific theories, which are simply definitions of scientific models. The question, "Is it true?" is meaningless in science. The correct question to ask is "Does it work?" That there is one of the most accurate encapsulations of the philosophy of chemistry that I have come across. It enunciates all the main features of good chemical models. Chemistry as a science is based much more on models than physics. Crucially, chemical models must be simple enough to be understood by experimentalists while remaining general enough to describe a wide range of situations. This is one reason why reductionism does not work so well in chemistry on a practical basis. Chemists also are more easily reconciled to the value of models as utilitarian constructs rather than representations of some deep and ultimate reality. Physicists worry much more about such things, and the fact that chemists don't does not make them any less scientific or any less enamored of the pursuit of truth. Chemistry much more than physics is about special cases rather than general phenomena. Chemists certainly care about general explanatory frameworks like chemical bonding, steric effects and electron transfer, but even there the thrust is not necessarily to uncover deep reality but to find something that works. The chemist is the perpetual tinkerer, and it is through tinkering that he or she is led to "the truth". Seeman's work as a curator of chemical history is incredibly valuable to the field, and those blue ACS autobiographies are fantastic. I am particularly fond of Roberts'. I haven't read Dewar's, but I've heard all sorts of stories about him. A very interesting guy, to say the least. His son is an accomplished CS prof at NYU. I like Roberts' too, along with Barton's and Djerassi's. It would be fantastic if Jeff could do another round. There's still so many organic chemists with extremely interesting careers; Schreiber, Houk, Breslow, Corey, Whitesides to name a few. "All models are wrong, but some are useful." "Remember that all models are wrong; the practical question is how wrong do they have to be to not be useful." Didn't notice the George Box quote in your About Me! I remember reading a couple of those volumes way back when as an undergraduate. They were the perfect procrastination tool for when I'd be in the library for extended periods of time. "Chemistry much more than physics is about special cases rather than general phenomena." I'm not sure I'd agree with this sentiment, at least with how chemistry is taught. University-level general chemistry borders on a tortuously absurd effort to reduce all of the course material to something derivable from just looking at the periodic table, and the standard advice regarding organic chemistry is focus on the concepts and not to memorize, otherwise you miss out on the most intellectually rewarding part of the field. Let's not forget the persistent claim of chemistry as the "central science," while we're at it. Staking that position is not one that a community that is primarily interested in "special cases" would seem inclined to do, to my way of thinking. Heh. I guess what I should have really said is "chemists are much less of philosophers than are physicists". What I meant is that you will find very few chemists (and there are certainly a few, predictably among theoretical chemists) who claim to be looking for a handful of "unified" principles explaining all of chemistry in all its manifestations. Part of the reason is that most chemists understand the sheer diversity and complexity of chemical systems and they are happy in either looking at specific cases or in loosely enunciating general principles that may or may not be rigorously reducible. As I mentioned, we do covet general principles, but we also understand that they may not be too general. Point taken about the relative scarcity of chemist-philosophers. I suppose there might be some connection with my impression that philosophy of science - as a field - has mostly been interested in physics and biology. "As I mentioned, we do covet general principles, but we also understand that they may not be too general." I can't help but think that - amusingly - might actually be part of the interest biological questions have historically held for chemists. If you can figure out how something works in, say, E. coli, you can almost certainly find homologous proteins in other organisms which have similar functions/roles.